Hello, this looked like the right place to post about my issue. I want to use hwinfo to set up a rainmeter skin on my new installation of Windows 10 (because they removed gadgets ) and for some reason the plugin is not able to see that hwinfo is running. "ERRO (00:00:00.078) : HWiNFO.dll: Could not connect to HWiNFO. 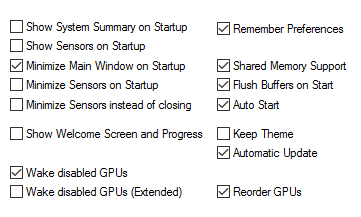 Please ensure HWiNFO is running, sensors are active, and shared memory is enabled." Im not sure what is wrong but it could have something to do with Windows 10? I am running Windows 10 Pro Insider Preview Build 10166. Intel i5 3570K, 16GB Corsair Vengeance 1600mhz, Nvidia GeForce GTX 970, Primary Drive: SSD 120GB, Secondary Drive: HDD 1TB. I don't think this is related to Windows 10, I have just tested it there and no issues. Does the HWiNFOSharedMemoryViewer report values ? No, the memory viewer is blank. It says it failed to connect. Which version of HWiNFO are you using? Is the HWiNFO sensors screen active? My HWiNFO version is v4.64-2530 and as far as I can tell, the sensors are active. They report values and I have it set to update on a 1s interval. Ok, I actually found my issue because of what you asked! I had no idea that the program didnt report sensor data when the sensor screen was not open, which is why it was saying I was not connected. I have it set up so that the sensors are always active in the dock now. Thank you for your help!